I’m not going to lie, Ellie’s bedroom from the old house is going to be hard to outdo. I mean seriously, she had a stage in her bedroom. But I’m going to try my hardest to give this little kid the best bedroom ever. 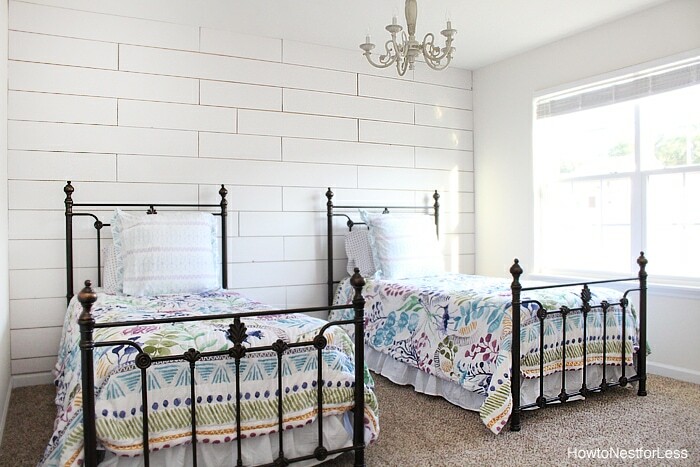 You guys saw a couple weeks ago that we started on her bedroom makeover with a DIY plank wall. Now it was time to add in some furniture. I really didn’t want to buy new stuff but the yellow color wasn’t quite cutting it. Ellie’s request? Blue, her favorite color. So after my inspirational trip to Memphis for the Amy Howard workshop, I decided to try out some of her One Step paints. I headed out to my local Ace Hardware and picked up the most adorable light teal color, Nottoway, and an off-white, Bauhaus Buff. Then I grabbed some light and dark antique wax, some brushes, and Amy’s cracked patina. 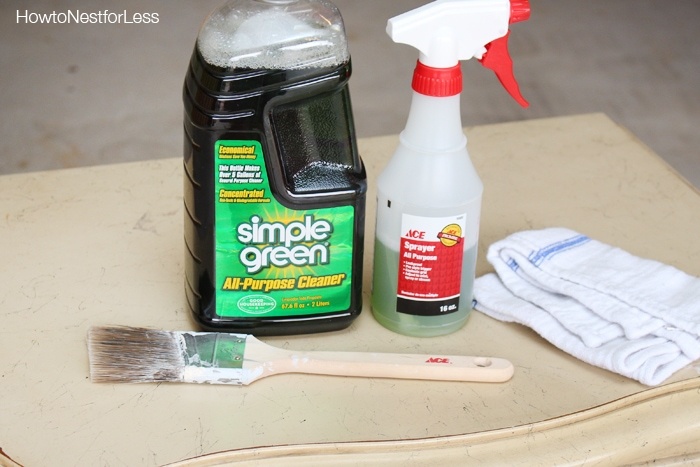 I started by cleaning Ellie’s nightstand with Simple Green (you can get this from Ace Hardware, too). It’s concentrate so make sure you get a spray bottle and water it down. Then just spray directly on the furniture and work around with a clean rag. I removed the drawers and hardware then I gave the entire nightstand a coat of Bauhaus Buff. 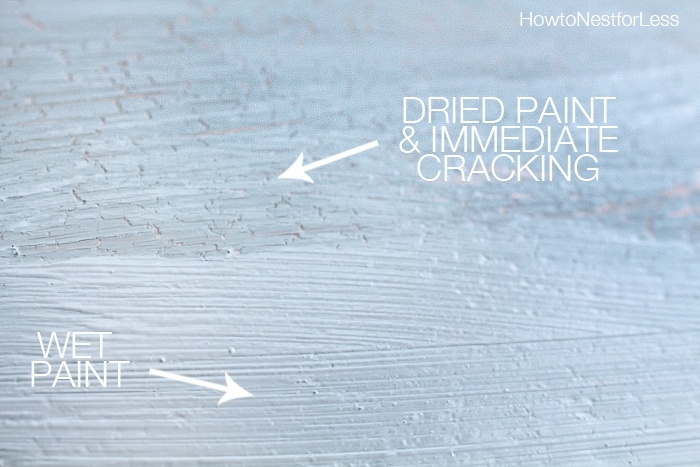 This is a chalk based paint so it dries quickly. 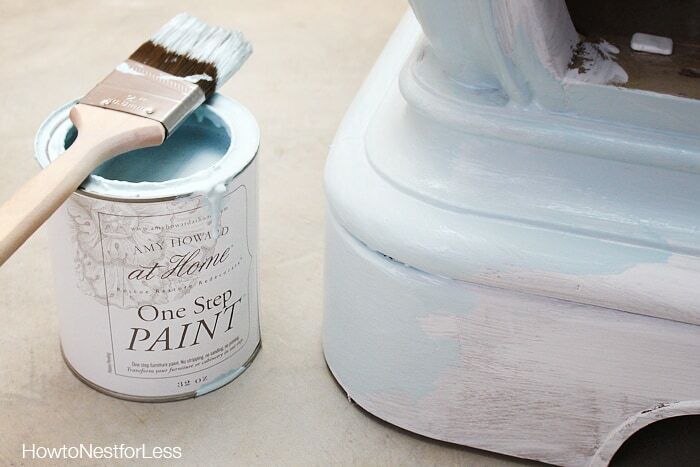 You’ll want to paint an area and move on so you don’t drag the paint and leave brush strokes. But this paint is awesome. Not to thick and chalky so it goes on easy and super smooth. Just remember this is One Step paint, not one coat. No sanding or stripping required but you might have to do 2 or maybe even 3 coats of paint if you’re doing a really light color. After the Bauhaus Buff color dried I painted the main part of the nightstand in a coat of Nottoway. 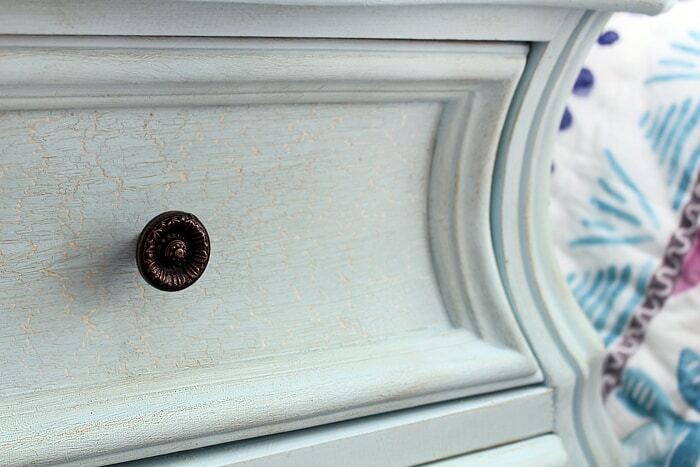 The reason I didn’t paint the drawers is because I decided to try the Cracked Patina from Amy Howard at Home. I played around with this stuff at the workshop and quickly fell in love! You just apply a thin layer directly on top of your first coat of paint and let it dry for about 30 minutes. Then you’ll apply your second color (always remember to do a lighter color below your final color). Immediately once you put on your second color over the cracked patina you’ll see it dry and start to crack. Amazing stuff! 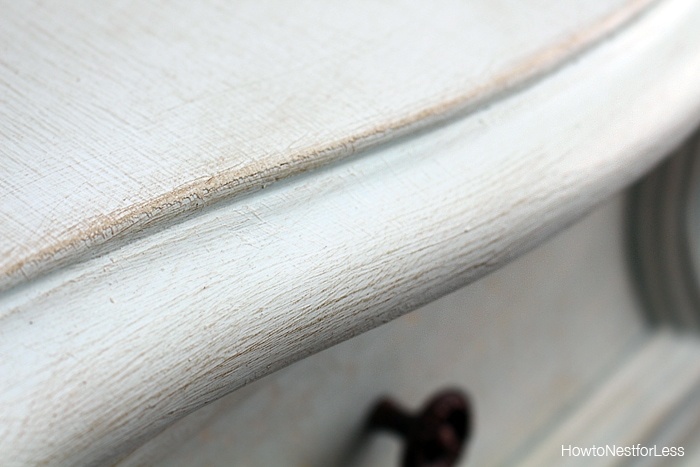 Now at this point you can pull away some of the cracked paint by agitating it with a brush or using your fingers to pull away some paint, but I decided to leave it with just the original cracking since it was a kid’s nightstand. Once the final coat of paint dried it was time to wax. 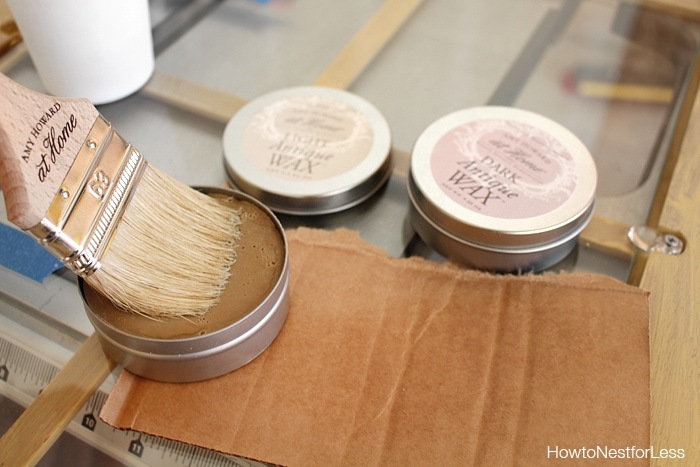 You’ll always want to start with the light wax, then add the dark wax once the light comes to tack. DO NOT over wax! 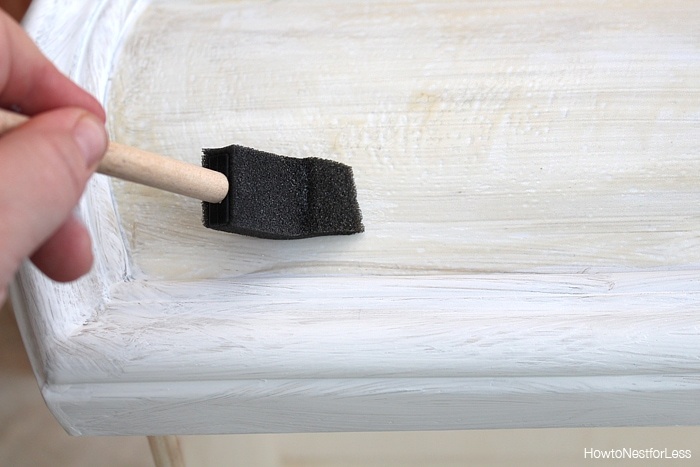 You’ll just want to whip your brush around the wax, then offload the brush onto a little spare piece of cardboard, then brush the wax on your furniture. Just use light, gentle passes, kind of just whipping your brush around the piece. The final look is gorgeous with the light and dark wax getting into the crevices and brush strokes of the paint! 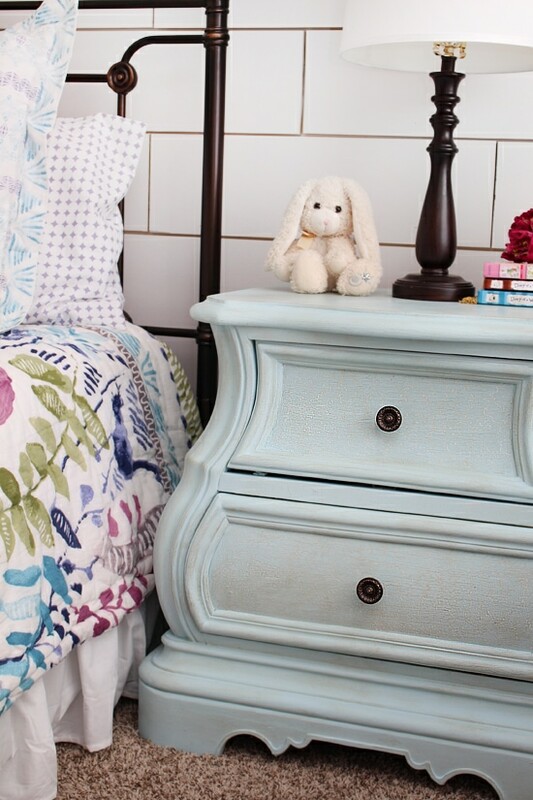 And here is the final nightstand in Ellie’s bedroom! I love the subtle cracked patina on the drawers. And the new simple hardware goes nicely with Ellie’s new twin beds. I’m almost done with her bedroom. Now I just have to paint the matching chest, build Ellie some bookshelves, and hang artwork on her other wall. But we are so close to knocking this room off our new home checklist! 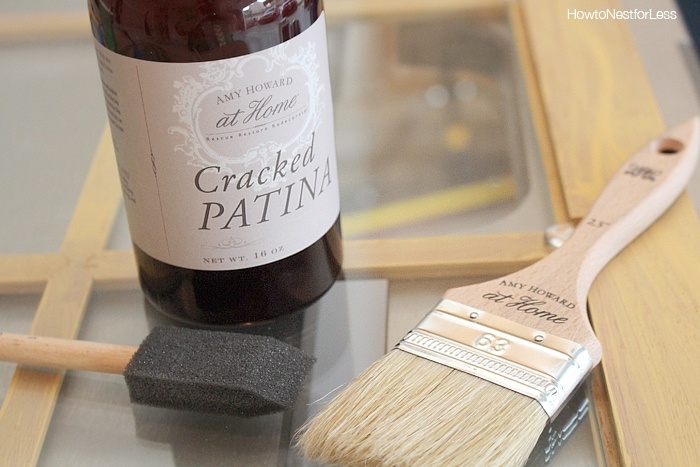 And I already have a couple other projects in the works using the Amy Howard at Home paints from Ace Hardware. Can’t wait to show you guys what this paint can do! Want to get in on the fun? 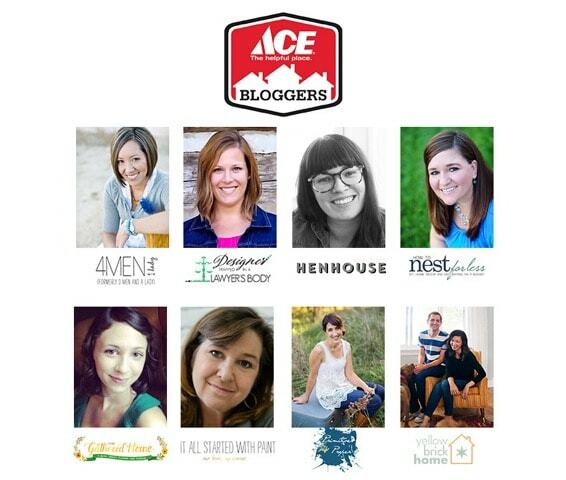 Go enter to win a $500 Ace Hardware gift card and a trip for 2 to an Amy Howard Workshop! Hurry, the giveaway ends on October 26th! 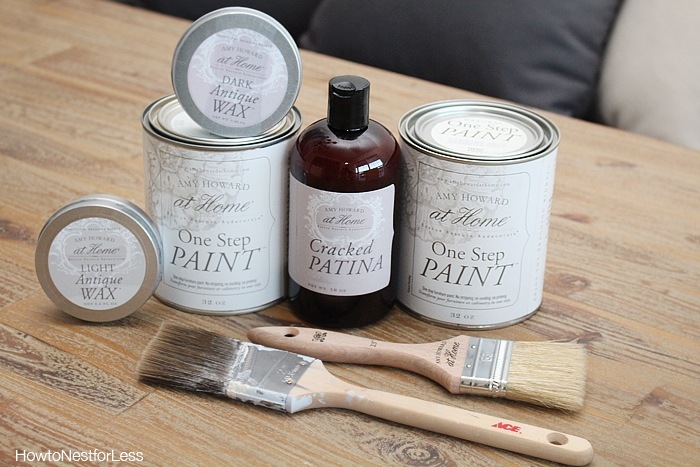 Stay tuned because tomorrow I’m giving away $100 gift card to Ace Hardware so you can stock up on some of Amy Howard’s One Step paint and complementary products! ERIN!!!! i had to use all caps and exclamations all over because i am in love! the nightstand and the space! what a lucky girl you have. This is amazing! 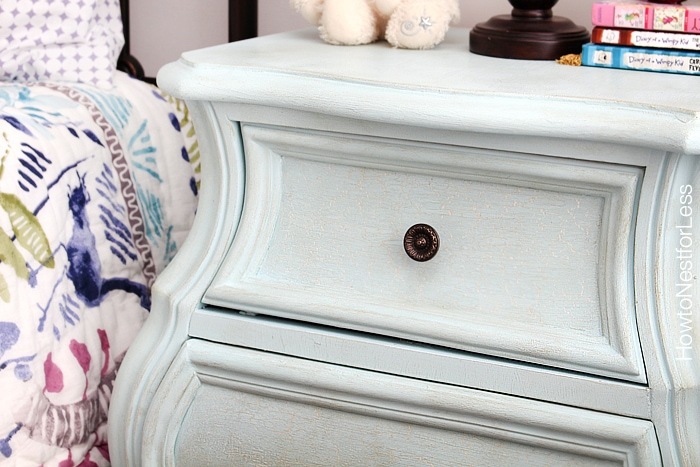 I just adore the color plus that gorgeous cracked patina on the drawers! 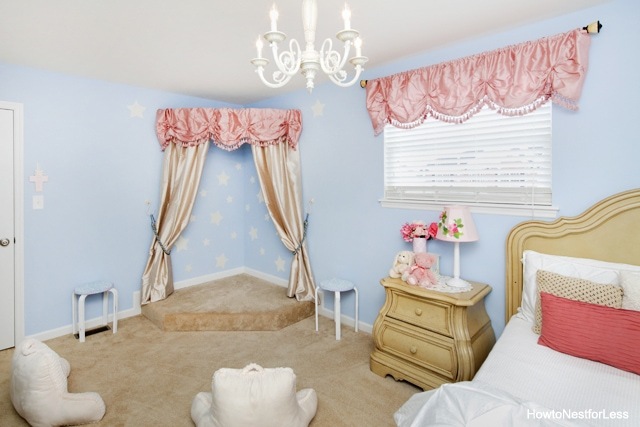 And don’t get me started on the adorable room! Ellie is one lucky girl! I saw that paint at my local Ace last week and wondered how it worked. I’ll have to grab some. The nightstand is simply gorgeous!! 🙂 Love It! Her room is looking great! You make the painting look so easy…flawless results! Side job of redoing old junker pieces & selling them is in your future! That is perfect! I love the color! I love that there is no sanding or priming. I hate all of those steps. LOVE everything about her room! What a lucky girl! I am looking at this again because I love what you have done to her room. I keep coming back and looking and the bedding. You might have listed it elsewhere, but where did you get her bedspreads! I love them! Well thank you!! The bedspreads are from Anthropologie! 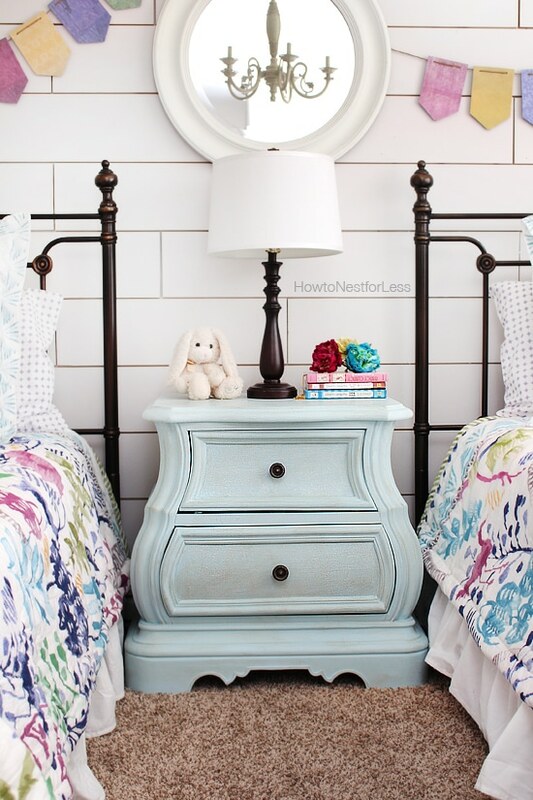 Very pretty – the nightstand and the room itself. 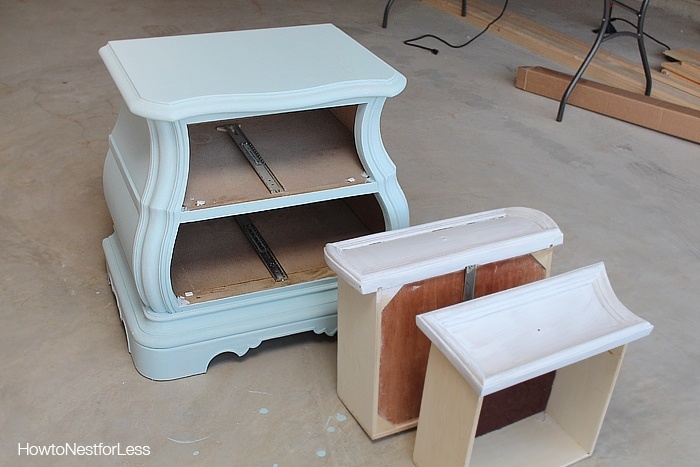 I have tried a few furniture refinishing projects and the part that always gets me in the final finish. I have yet to experiment with wax but I’m wondering if it will hold up better than poly or some of the other finishing products. Very beautiful, you did a fantastic job!! 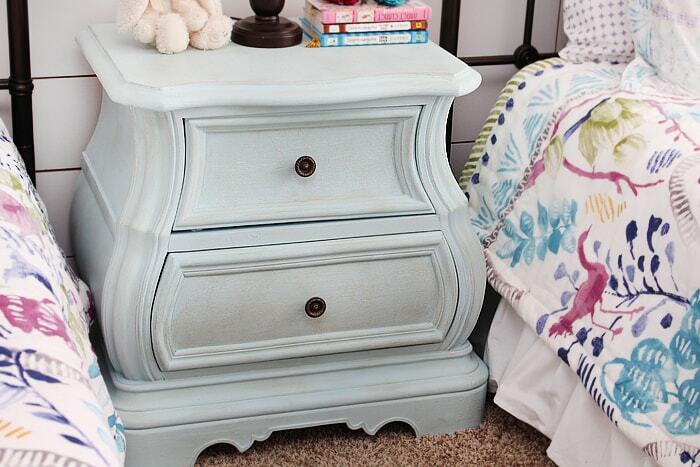 Oh my gosh, I just LOVE everything about your daughter’s nightstand makeover! The color is gorgeous and the crackling detail on the drawer fronts is perfection. After seeing a few projects and videos from the Amy Howard workshop, I am inspired to try this product. Love that they offer light and dark wax. 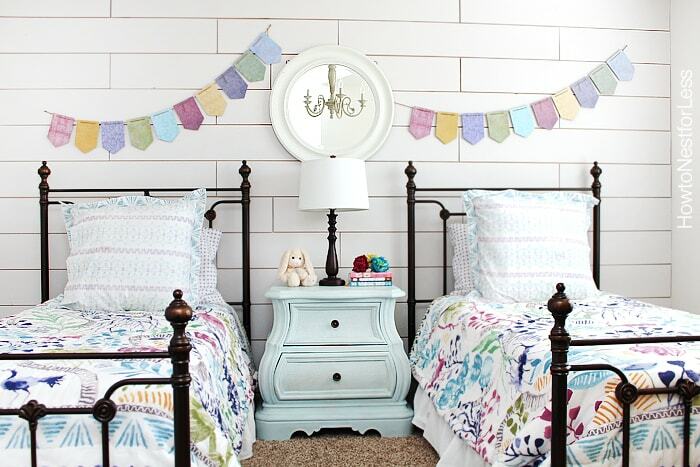 Your daughter’s room makeover is coming along beautifully too – love that wall! Thanks so much Marie! You have to try the paints. They are simply amazing!! The nightstand looks absolutely perfect in her room. Everything in Ellie’s room is just beautiful!! Gorgeous room! I would have loved a room like that as a young girl (but I agree, that stage was pretty sweet). Cant wait to see what else you do. This is such a beautiful room. There is a crispness to the whole space. I really like the paint you used and the cracking effect was just subtle enough without looking sloppy at all. What a beautiful bedroom. Love the night stand and the color you choose. Absolutely adorable!!!! It is truly one of the prettiest things I have seen in a while!!! The room is going to be amazing! Erin, what a great job you did in this room! Well-deserved feature on the Scoop! Merry Christmas! Thank you so much Rita! Merry Christmas to you! !